Scope: Incorporating Corporate Social Responsibility (CSR) in business strategies is becoming common practice. Organizations increasingly include CSR in their sourcing strategy as well. 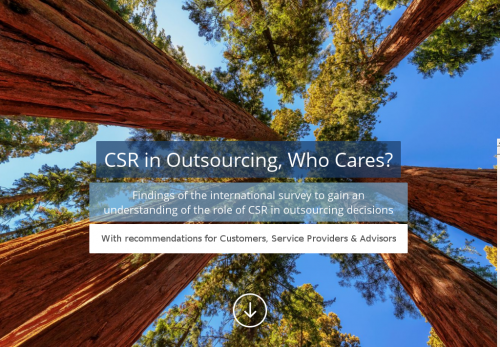 In this research, we were particularly interested in whether, why, and how CSR actually gets integrated in outsourcing decisions world-wide. Method: To gain further insight in the reasons for integrating CSR in outsourcing, we asked Customer/Buyers, Service Providers, and Advisors to anonymously complete an online survey. The survey covered questions about their personal belief in the importance of CSR, whether it is part of the sourcing strategy, is included in RfPs, is part of the decision-making process in selecting an outsourcing provider, etc. The survey also covered CSR topics that are deemed important by decision-makers and topics that are included in the decision-making process. Results: Through statistical analyses we were able to draw comparisons between the three respondent groups. While our study confirmed the trend that CSR is regularly included in business strategies, it appears that CSR in IT strategies is less common. CSR in outsourcing is deemed important by decision-makers in outsourcing, but is not correspondingly included in the actual decision-making. There are big differences between the respondents groups about whether CSR in outsourcing is important for decision-makers, what topics are important and whether or not CSR is weighted in the decision-making. Based on the quantitative findings, we give overall recommendations, as well as suggestions for each of the three respondent groups. We are learning more and more about the devastating effects of human (industrial) activities on the well-being of the planet and its inhabitants. Efforts to combat these effects, and change the nature of the activities that cause them, are also being stepped up. A recent example of this is the Paris Climate Agreement, in which 196 governments agreed to jointly tackle the issue of global warming. However, achieving the objectives of this agreement will be a significant challenge for these governments and businesses over the next decade. To meet the objectives, governments will have to introduce and/or improve policies that will guide businesses towards low (or rather zero) emission activities, under the pressure of a market that is currently built on carbon-intensive activities and linear year-on-year growth. Businesses on the other hand, will have to find ways to reduce their own carbon output and work with their suppliers to move towards a sustainable way of working. Take the clothing industry, for example: A lot of production takes place in Bangladesh. Geographically, this also happens to be one of the areas most affected by the damaging effects of climate change. It is therefore crucial for the textile industry to reduce climate change and its effects. Without any change, the clothing companies themselves are at risk, as their supply relies on vulnerable production facilities (Wei, et al., 2016). It is therefore imperative that these companies purposefully work with their suppliers to take action. Apart from risks to the supply chain, stakeholders (clients, shareholders, customers) are also aware of actions taken by organizations regarding our environment and social well-being. As a result, Corporate Social Responsibility (CSR) has been a topic of growing importance for many years. We certainly increasingly see more organizations with a social and/or environmental mission. However, traditional businesses still have a legacy of doing things the ‘old-fashioned’ way, and incorporating CSR can be challenging. We, the authors, underwrite the importance of CSR to achieve a sustainable world. As sourcing advisors, we want to gain insight into the reasons why and the mechanisms through which organizations apply CSR in their sourcing decisions. The results of the conducted study serve to address the challenges faced by the organizations themselves, as well as their suppliers and advisors. The article will finish by mentioning its strengths, limitations and possibilities for future research. Companies are increasingly taking their own competitive advantages and those of their suppliers into consideration (Kotabe & Murray, 2004; Talluri & Narasimhan, 2004). This allows a firm to exploit its own capabilities, as well as to learn new capabilities or obtain new technologies via its suppliers and partners, hence sharing risks and gaining synergy. Sustainability in outsourcing is becoming increasingly important (Babin & Nicholson, 2012; Pagell, Wu, & Wasserman, 2010), and may well form part of a company’s competitive advantage. Several external factors lead organizations to value social and environmental sustainability: in the first place because stakeholders (customers, shareholders, labor unions, etc.) expect it. Secondly, governments and regulators are defining their requirements for sustainable conduct, followed by the fact that Non-Governmental Organizations (NGOs) have established sustainability standards to measure global organizations. This sets a standard for an organization’s actions and allows customers to compare their products based on objective certification. Finally, proactive outsourcers adopt sustainability capabilities that give them the competitive advantage in the outsourcing market. Cruz (2009) and Seuring & Müller (2008) come to similar conclusions when they summarize several sources stating that organizations engage in CSR to (1) enhance their reputation, (2) preempt legal sanctions, (3) respond to the aforementioned NGO actions, (4) manage risks, or (5) generate customer loyalty. In the current study, we aim to replicate the above results, and go further by weighing up these external (or strategic) factors against the intrinsic belief of an outsourcing decision-maker as a driving factor to take sustainability into account when taking outsourcing decisions. Considering the fact that strategic dimensions and capabilities of suppliers are generally taken into account in the outsourcing strategy, we also expect to find a correlation between the presence of a CSR policy, as well as the personal beliefs of a decision-maker regarding the importance of CSR, and the degree to which CSR is taken into account in outsourcing decisions. Research suggests that to effectively apply CSR in the supply chain, it needs to be truly embedded in the entire organization, including all subsidiaries abroad and offshore. It is also suggested that there should be training and incentives involved at supplier level, as well as auditing of activities (Andersen & Skjoet-Larsen, 2009; Ciliberti, Pontrandolfo, & Scozzi, 2008). From the ambition to embed CSR in the own organization and the entire supply chain, it logically follows that CSR should be included in the outsourcing strategy (Hutchins & Sutherland, 2008). According to Pagell, Wu, & Wasserman (2010), sustainable supply chain management is a logical consequence of having a CSR ambition. When CSR is poorly managed throughout the supply chain, it poses a risk to the triple bottom line (economic, environmental, and social impact). However, in their article they propose an extension of this notion by suggesting that the opposite also holds true, namely that the higher the threat to the triple bottom line, the higher the risk to the supply chain. Take the example of the clothing industry, as mentioned in the introduction, which describes a situation in which there is substantial risk in the supply chain due to the consequences of climate change. Because if the environment, as part of the triple bottom line, is not taken into account, the whole supply chain is at risk. Vice versa, by managing the effect on the triple bottom line properly, supply-base continuity is assured. This dynamic underlines the importance of taking sustainability into account when making outsourcing decisions. As part of our current study we aim to assess to what degree ‘managing CSR throughout the supply chain’ is a motivating factor for decision-makers to include CSR capabilities in their provider selection. The ISO 26000 is the international standard for social responsibility by the International Organization for Standardization (ISO). It provides guidance on how businesses and organizations can operate in a socially responsible way (Buck, Espinach, & Soderberg, 2014). The standard identifies seven main areas that should form an integral part of companies that value CSR: (1) organizational governance, (2) human rights (discrimination, vulnerable groups including minority groups), (3) labor practices (labor standards, health and safety, fair wages), (4) environment (pollution, sustainable resource use), (5) fair operating practices (ethical conduct, anti-corruption), (6) consumer protection and issues (consumer support, service, data protection and privacy), and (7) community involvement and development (social, employment, education) (Babin & Hefley, 2013; Buck, Espinach, & Soderberg, 2014; MVO Nederland, 2014). ISO 26000 allows an organization to discuss with their stakeholders how all or some of the seven principles of CSR should be addressed or implemented. In addition to ISO 26000, the new ISO/DIS 20400 standard is currently being developed to specifically address Sustainable Procurement. Whereas the former addresses CSR in general, this new standard offers practical advice specifically for organizations that want to manage CSR throughout the supply chain and are looking to develop a sustainable procurement strategy. The standard focuses on both the procurement function and its process by providing guidance on how to create the right conditions, use appropriate management techniques, and incorporate their CSR goals into their procurement activities and manage sustainability in the supply chain. In our study, we are interested in which areas organizations focus on when taking CSR into account in their outsourcing. We also investigated which methods organizations employ to take CSR into account in their supplier selection. Finally, and in addition to the various research questions outlined above, our main contribution to the international research field is by investigating whether there are differences between the motivations and mechanisms to incorporate CSR in outsourcing as identified by customer/buyers, and the perception of those motivations and mechanisms by their providers and advisors. the areas in which CSR is considered (based on the ISO 26000:2010 norm). Is CSR considered important in outsourcing? What are the main reasons to take CSR into account when making outsourcing decisions? What areas of sustainability receive focus when considering CSR in outsourcing decisions? For each question, the data was first analyzed based on the complete group of respondents. Subsequently, the responses were divided into groups based on respondent type (Customer/Buyer, Service Provider, Advisor), which allowed us to check whether there were any significant differences between the three groups. P-values are traditionally used to report statistical findings. They provide an indication of the confidence one can attach to the finding. A p-value has to be lower than 0.05 to be considered statistically significant. In other words, the lower the p-value, the higher the confidence one can attach to the finding. The data provides insights into the motivations of individuals and organizations to include or exempt CSR in outsourcing decisions. Some findings were in line with expectations based on the scientific literature, while others were more surprising. In general, the data corresponds with our observations as outsourcing professionals. We received a total of 117 usable responses, of which 48% came from Customers/Buyers, 26% from Service Providers, and 26% from Advisors. Although each continent was represented in the responses, a disproportionately large group of respondents resided either in the United States of America (26.5%), or Western Europe (50%). This pattern is in line with the location of IAOP and Quint Wellington Redwood who distributed the survey. The response pool was too small to analyze whether there were differences based on demographics such as age, gender, or geographical location, hence respondents were either grouped together as a whole or divided only by respondent type (Customer/Buyer, Service Provider, Advisor). The majority of the respondents (85%) recognize the importance of CSR in outsourcing, and only 9% think it is not important now, nor will it be in the future. We observe a positive feedback loop, because the greater the importance a respondent currently attaches to CSR in outsourcing, the more they expect the importance to increase even further in the future (p≈ .00). This opinion is carried by all respondent types equally; there were no differences between the various groups. Customer/Buyers are consistent in their view, as those who find CSR important also indicate that they give preference to CSR providers more often (p= .003), and assign (more) weight to CSR capabilities in their selection criteria (p= .004). Those who don’t value CSR in outsourcing, also don’t give any preference to CSR providers or attach weight to it in their selection criteria. However, despite its significance, the strength of this correlation is only moderate as some responses deviate from the general relationship between personal belief in CSR and weight attached to it. For example, 14% of the Customer/Buyers ‘Agree’ or ’Strongly Agree’ that CSR is important while never assigning weight to CSR capabilities when selecting an outsourcing provider. It is furthermore interesting to note that there is a strong, significant difference in opinion between respondent groups on how often a Customer/Buyer gives preference to providers with CSR capabilities (p= .005). Based on the data, the picture emerges that Customer/Buyers think they do give preference to CSR providers, while Service Providers are not as aware of that, and Advisors don’t agree that their clients do indeed give preference as often as they think they do. My (clients’) stakeholders (e.g. clients, consumers, employees, governmental organizations, and/or non-governmental organizations) demand it (38.8%). We (or our clients) feel that we should manage CSR throughout our supply chain (38.1%). I (or our clients’ decision-maker) personally believe in CSR (33.1%). When the reasons identified by the three different respondent groups are compared, only the frequency with which ‘Managing CSR throughout the supply chain’ is identified differs marginally between Service Providers and Customer/Buyers (p= .073), in the sense that Customer/Buyers cite it more often as a reason than Service Providers think it is for their clients. These results confirm previous research, namely that external factors are the most important drivers. However, while not included in previous research, our data also reveals that the intrinsic motivation of the decision-maker considerably influences whether organizations take CSR into account in their outsourcing decisions. Looking at the issues that organizations aim to address by considering CSR in outsourcing decisions, the results are less straightforward. The three respondent groups prioritize the topics significantly differently. For example, ‘Fair operating practices’ is the issue most commonly considered by Customer/Buyers when evaluating CSR. However, Advisors indicate that they think that for their clients it only shares a third place together with ‘Human rights’. Conversely, the issue that Advisors thought was most often considered by their clients, ‘Environmental issues’, only reaches a shared third place for Customer/Buyers. Similarly, while Service Providers are under the impression that their clients consider ‘Consumer issues’, Customer/Buyers themselves only rate it in 5th place. However, there is one topic that all groups agree on: ‘Community involvement’ is thought to be least often considered when evaluating CSR capabilities across the three respondent types. Perhaps an even more salient finding than the differences in prioritization between the respondent groups is the fact that Service Providers assume that their clients consider fewer topics for CSR (p= .047). More specifically, while the majority of both Customer/Buyers and Advisors indicate that three or more topics are considered when evaluating CSR practices, the majority of Service Providers identify only two or less. In addition to considering fewer topics, Service Providers also think that their clients consider any particular issue less frequently. This difference is either significant or marginally significant for the top three topics that Customer/Buyers base their evaluation on (p= .083; p= .106; p= .031, respectively). If CSR is taken into account when making outsourcing decisions, the most common way to do this is by including questions related to CSR in the Request for Proposals, followed by including Service Providers with proven CSR capabilities in the outsourcing process. Weighting questions on CSR in the RfP only comes in third place. Lastly, service providers who pursue a social or environmental cause are included in the outsourcing process. There are no significant differences between the three respondent groups. Our findings confirm the relevance of the topic of this paper, as nearly all respondents (85%) share the opinion that CSR is currently important in outsourcing, and even more of them believe that its importance will increase in the future. However, despite the agreement on its importance, there is no unanimous action to incorporate CSR in procurement processes. As long as Service Providers do not realize that their clients value CSR, and Customer/Buyers do not recognize that Service Providers differentiate on CSR capabilities, progress will be hindered. Yet at the same time, incorporating CSR and managing it in the supply chain can create a competitive advantage to organizations. Therefore, all those who recognize the importance of CSR (and frankly, even those who do not), should care about CSR in outsourcing. This paper serves both as a mirror to each party involved in the outsourcing process, and as a conversation starter between those parties. We provide specific recommendations below, tailored to each outsourcing party, and include strategic and practical actions that can be taken to improve the inclusion of CSR in outsourcing. However, both in our empirical findings and our professional experience we observe a discrepancy between the various parties in the perceived value, reasons, and methods to include CSR in outsourcing. Hence, our main recommendation to everyone in the outsourcing field, regardless of their personal belief, is to put CSR on the agenda and make it a standard topic for conversation. Are there (strategic) policies on sustainability or CSR in our (client’s/provider’s) organization? Which goals have been formulated for IT as a result of these business policies? How is the governance affected by the sustainability goals, is the organization differently organized? How have these goals been operationalized in standards, certifications and a code of conduct? In what way do these goals affect relationships with partners and suppliers? Which requirements are set? To what extent are KPIs linked to sustainability goals and what are the consequences if these KPIs are not met? How do employees get involved with the sustainability policy? How is compliance with the sustainability policy monitored and reported? What laws and regulations are applicable to our organization (and its supply chain), including both foreign and domestic? Be vocal about the pursuit of CSR, let others know it is an elementary aspect of doing business with you. Our findings suggest that both Service Providers and Advisors are often not as aware of the value your organization attaches to CSR, nor of the presence of a CSR policy at strategic and/or IT level. So, if your organization (or you personally) values CSR, make sure you beat the drum about it. Share CSR policies pro-actively with advisors, and at the very least, include references to CSR policies in the description of your organization when writing RfPs. Businesses that are further advanced should consider creating selection criteria based on CSR capabilities, and strengthen their commitment by assigning weight to them. This advice definitely applies to the small but contradictory group of Customer/Buyers (14%) who are convinced or even strongly convinced of the importance of CSR, yet never assign weight to CSR capabilities in their selection process. Our data also indicates that even if providers and advisors recognize the value you attach to CSR in general, they assume different focal areas for CSR. For example, Service Providers are under the impression that their clients care about ‘Consumer Issues’ more than they actually do. Once Service Providers are aware of the value and focus that you, as their client, attach to CSR, differentiation on these capabilities will logically follow, as they try to remain competitive and win new business. For organizations that want to increase the integration of CSR in their outsourcing decisions, ensuring the presence and integration of CSR in both business and IT policies is a good start, as we find that they are generally a good predictor of the preference that is given to CSR providers. While many organizations have included CSR in their business policy, it is interesting to observe that it has often not trickled down to be included in the IT policy. Given that IT is more and more positioned as the enabler of the business, the presence of CSR in IT outsourcing is particularly relevant. In addition to adopting CSR policies and changing the selection processes, our research also suggests the importance of selecting the right people to fulfill the decision-making role in procurement, as ‘Personal beliefs of the decision-maker’ is in the top three of reasons to take CSR into account in outsourcing. Furthermore, the stronger the decision-maker’s beliefs in CSR, the more frequently they give preference to providers with CSR capabilities, and the more weight is assigned to those capabilities in selection criteria. For Customer/Buyers, the above list of questions can be used as a starting point to incorporate CSR in the procurement process. For further guidance on implementing sustainable procurement, you should consult the ISO/DIS 20400 standards. Having sustainability high up on your own agenda ensures recognition for CSR capabilities by your clients. Set the standard and lead by example. Service Providers personally value CSR to the same degree as individuals in Customer/Buyer organizations. However, the most salient finding of our study relating to Service Providers is that, on the whole, they underestimate the value their clients attach to CSR in their decision-making. As a result, your organization misses opportunities to win business over your competitors, because your clients are not aware of any CSR capabilities that would give you an edge in the provider selection process. If your organization already has CSR capabilities, ensure you share them publicly and frequently. Include them in your RfP responses, regardless of the listed requirements. Better yet, ask specific questions regarding CSR prior to submitting your proposal and adapt it accordingly. The questions mentioned in the general recommendations and the findings of our current research provide topics for this conversation. However, if your organization has not yet developed CSR capabilities, and has not yet included them in their business and IT strategy, now is the time to put things right. Consider that while CSR may currently not be a major selection criterion, it is becoming increasingly important. The race has already begun, but the field is still open. Differentiating yourself as CSR Provider gives you the chance to break through the apparent standstill, set the standard, and in doing so stave off the competition. As CSR emerges, being among the first to create a proposition allows Service Providers to create stronger relationships with their clients. The questions mentioned earlier can be used to develop CSR capabilities; further guidelines are covered by ISO 26000/DIS20400. When addressing CSR with your client or prospect, it is important to keep in mind that the presence of a CSR policy is not the most dominant driving factor. Instead, focus your attention on their stakeholders and regulators, and inquire whether they consider ‘managing CSR throughout the supply chain’ to be important. Additionally, and if possible, gauge how the decision-maker feels about CSR, as this also turns out to be a valid indicator of the value that is attached to it in the selection process. Also, gauge the help you might be able to provide them to help reach the CSR goals. Finally, remember to ask about which areas your clients focus their CSR efforts, so your proposal can be aligned accordingly. Because it is in their interest to see both sides succeed, Advisors are the perfect catalyst for spreading knowledge on CSR, and improving the skills level and maturity of the field. Advisors personally value the importance of CSR in outsourcing, now and in the future, to the same degree as the other respondent groups. The discrepancy between perceived and actual value attached by both other parties to CSR in the decision-making process creates a new challenge in your field that requires attention. As the expert, you are perfectly positioned to facilitate the conversation about CSR between Customers/Buyers and Service Providers. It is therefore pertinent to address the fact that you, as a group, significantly underestimate the presence of a CSR policy and that, additionally, you seem to disagree with your clients about how often they give preference to CSR providers. The former can be resolved by incorporating CSR as a topic in your assessment, and by ensuring that questions relating to CSR become a standard part of the conversations between you and your clients. However, the latter requires your professional expertise, to ensure that your clients actually change their procurement process to favor CSR capabilities as often as they think they do. To achieve this, you will need to create and record best practices, standards and lessons learned, as well as providing benchmarks and a common vocabulary for this subject. Because the presence of a CSR policy at the business and IT levels is a fair predictor for the preference that is given to CSR providers, this is a good starting point. Based on the questions listed earlier, you can assess the importance of CSR in the procurement process, and start to assess the CSR maturity of your client. Depending on their CSR maturity, use your skills to guide your clients in formulating policies, KPIs, and SLAs regarding CSR as part of their general and IT outsourcing strategy. It is relevant to note here, that Advisors and Customer/Buyers differed most on the CSR topics that were (perceived to be) considered. More specifically, Advisors were under the impression that ‘Environmental issues’ were the most important to consider in CSR, whereas Customer/Buyers only ranked this topic in a shared third place. This divergence signifies once again the importance of staying attuned to your clients’ values and capabilities. CSR is steadily moving from an optional topic in outsourcing, to an essential one. To stay ahead of the game, Advisors will need to rapidly develop their skills and knowledge. The ISO 26000 and 20400 standards provide a good framework to build future practices on. As experts, you will have to advocate the importance of the triple bottom line, and educate your clients about its impact on their supply-base continuity. You will have to be able to advise on the ways by which CSR can be incorporated into the procurement process, and how it can be managed throughout the supply chain. A major strength of this study is that it incorporates multiple points of view. In addition to the most obvious party, the Consumer/Buyers, we also included Service Providers, who carry out a complementary role in outsourcing agreements. By the nature of this relationship, they will perform most of the activities that are influenced by valuing CSR in outsourcing decisions. The third common player in the outsourcing field is the Advisor, who has the ability to influence the relationship between Customers/Buyers and Service Providers by sharing knowledge and guiding outsourcing initiatives. This way, the most common interactions in outsourcing are covered. It also allowed us to draw valuable insights and conclusions, based on the comparison between the opinions of the three respondent groups. As a result, we were able to provide tangible recommendations on how to advance the case for CSR in the future. One of the limitations of this study is the relatively narrow reach of the survey, as it was sent to the databases of just two organizations. Although the survey was shared through online channels, the number of respondents did not allow us to investigate the influence of demographics such as age, gender, or geographical location on our findings. As the group of respondents is relatively low, the outcome of this study may not reflect the entire outsourcing market. In this study, the respondents were also asked to respond only if they were decision-makers, or could influence decisions. Future research should invite everybody to respond to the survey, to reduce the selection bias, and potentially to compare the opinions of those who influence decisions and those who do not. Furthermore, the title of the survey (‘CSR in Outsourcing’) may have created a bias towards those who find CSR an important issue, as they may be more likely to respond to the survey than those who do not. Additionally, as in most studies, we cannot rule out that some respondents gave socially desirable answers. Finally, the responses of each group do not pertain to the same contract. For example, in theory the difference between perceived and actual preference given to CSR providers could be caused by the fact that the Service Providers serve a distinctly different group of Customer/Buyers than the ones that completed the survey. Although this is highly unlikely, based on the current data, it is impossible to rule out, as no identifying information was collected about the respondents, nor about their respective organizations. To confirm the validity of the reported results, this study should be replicated with a larger sample size, in which the respondent types are equally distributed. It would be particularly interesting to collect responses from the various parties in relation to a specific contract so that, for example, the exact differences between perceived and actual value assigned to CSR capabilities can be calculated and assessed. S.P. Vrolijk, B ICT, MBA, COP. In addition to extended quantitative research, a qualitative study would enable a deeper examination of the mechanisms and motivations behind the current results. Contrasting the approaches of companies who either do or do not take CSR into account in outsourcing could provide compelling insights into best practices. This line of research would also facilitate the assessment of the unforeseen benefits of incorporating CSR in outsourcing decisions, which may in turn serve as convincing arguments for companies who are not yet doing so. We challenge ourselves and our clients to realize concrete improvements and results. This means we are not afraid to voice opinions or to question our own opinions and those of others. We do not provide advice from the sidelines but are actively engaged with our clients. Quint brings the worlds of business and technology together. We share knowledge and arrange partnerships to accelerate change and innovation. We develop teams and people using new forms of collaboration and leadership so that everyone can realize their full potential and grow within the organization. The focus in this is firmly on lean and agility. Quint regards people, process and technology as factors that strengthen each other. Together they form the basis of sustainable change. We use analysis, development and implementation to connect and improve these factors. Thanks to our training and coaching, we embed the capacity for change within organizations so that they can continue their transformation without Quint’s presence. Andersen, M., & Skjoet-Larsen, T. (2009). Corporate social responsibility in global supply chains. Supply Chain Management: An International Journal, 75-86. Babin, R., & Hefley, B. (2013). The Outsourcing Professionals’ Guide to Corporate Responsibility. Zaltbommel: Van Haren Publishing. Babin, R., & Nicholson, B. (2012). Sustainable Global Outsourcing: Achieving Social and Environmental Responsibility in Global IT and Business Process Outsourcing. London: Palgrave Macmillan. Buck, B., Espinach, L., & Soderberg, S. (2014). GRI G4 Guidelines and ISO 26000:2010 How to use the GRI G4 Guidelines and ISO 26000 in conjunction. Amsterdam: ISO & GRI. Ciliberti, F., Pontrandolfo, P., & Scozzi, B. (2008). Investigating corporate social responsibility in supply chains: a SME perspective. Journal of Cleaner Production, 1579-1588. Cruz, J. (2009, August 8). The impact of corporate social responsibility in supply chain management: Multicriteria decision-making approach. Decision Support Systems, 48, 224-236. Hutchins, M., & Sutherland, J. (2008). An exploration of measures of social sustainability and their application to supply chain decisions. Journal of Cleaner Production, 1688-1698. Kotabe, M., & Murray, J. (2004). Global sourcing strategy and sustainable competitive advantage. Industrial Marketing Management, 7-14. MVO Nederland. (2014). iso-26000/de-inhoud. Retrieved November 30, 2016 from mvonederland.nl: http://www.mvonederland.nl/iso-26000/de-inhoud. Pagell, M., Wu, Z., & Wasserman, M. (2010). Thinking differently about purchasing portfolios: an assessment of sustainable sourcing. Journal of Supply Chain Management, 46(1), 57-68. Seuring, S., & Müller, M. (2008, June 12). From a literature review to a conceptual framework for sustainable supply chain management. Journal of Cleaner Production, 16, 1699-1710. Talluri, S., & Narasimhan, R. (2004). A methodology for strategic sourcing. European journal of operational research, 236-250. Wei, D.; Cameron, E.; Harris, S.; Prattico, E.; Scheerder, G.; and Zhou, J. (2016) The Paris Agreement: What it Means for Business; We Mean Business; New York.